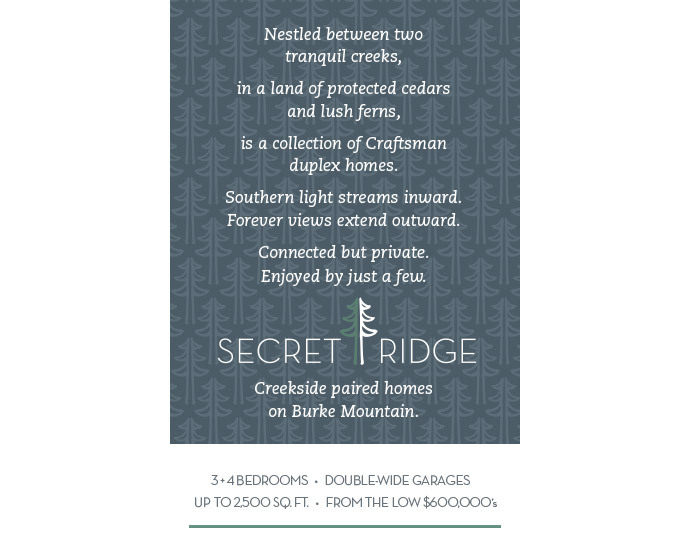 Situated in the heart of The Foothills of Burke Mountain, Secret Ridge by Mission Group is a new enclave of 74 craftsman designed creekside residences situated in this most sought after master planned neighbourhood. Secret Ridge Coquitlam by Mission Group is surrounded by nature and bordered by beautiful Smiling Creek on either side of the homes, making it the most exclusive and private setting featured in any new home development on The Foothills of Burke Mountain. The large three and four bedroom paired duplex-style Coquitlam Secret Ridge homes for sale are also very spacious with open concept floor plans ranging between 2,200 to about 2,500 square feet in size. Many are oriented towards the beautiful southern valley views of Burke Mountain below. The Mission Group Secret Ridge Coquitlam home community is expected to launch pre-sales in early 2013. With only 74 opportunities to purchase in this boutique offering, the Foothills of Burke Mountain Coquitlam Secret Ridge duplex style homes will be highly sought after. Another great feature of these impressive craftsman style duplexes are the double wide garages with driveways. Many of the floor plans also feature main floor great rooms with vaulted cathedral-like ceilings. Others feature master ensuites and bedrooms on the main level for convenience. The kitchens are superbly finished with the highest end appliances, beautiful counters and custom cabinetry. The bathrooms are spa inspired with a sleek and modern look and feel. The architecture of the new Burke Mountain Coquitlam Secret Ridge homes for sale is by award winning and renowned Robert Ciccozzi Architects. The interiors are designed by i3 Interior Design while construction and development is by trusted MGC Construction. The developer is The Mission Group. Single family homes at The Foothills on Burke Mountain at Secret Ridge by Mission Group. This special opportunity coming to the Burke Mountain Coquitlam real estate neighbourhood will feature executive homes with appealing gabled architecture and plenty of contemporary sizzle inside. Located on a treed site between two sparking creeks, Secret Ridge Coquitlam Burke Mountain homes for sale will feature an exclusive release of only forty four homes. Half of these homes are two storey residences while the other half are walkout ranchers, giving you plenty of choices depending on your life story. The new Burke Mountain Coquitlam Secret Ridge homes for sale will launch an impressive show home early in the new year at 3458 Burke Mountain Village Promenade Coquitlam BC. You can visit www.missiongroup.ca for more information as it is released. Coming early 2013, the 74 craftsman designed Burke Mountain Secret Ridge Coquitlam homes for sale will start from just the low $600,000’s making them very affordable for today’s couples and families. The ‘Creekside Paired Homes’ at Secret Ridge Coquitlam by the Mission Group will be naturally designed as a private enclave surrounded by greenery and bordered by the protected East and West Smiling Creek on both sides of the community. Connected yet exclusive, the new Secret Ridge Coquitlam Burke Mountain paired homes will be one of the most sought after and affordable developments in the area for some time. You can visit www.secretridge.ca for more information as they become available. The scheduled presale launch is for early 2013, so stay tuned! The architecture of the Secret Ridge Homes in Burke Mountain Coquitlam is by Robert Ciccozzi. The interior design is by award winning i3 Interior Designers. The construction team is by MGC Construction. Construction is already underway for the presentation centre and display homes located at Burke Village Promenade (off Soball Street) in Coquitlam BC. Welcome to the most exciting 2013 Burke Mountain Coquitlam real estate development! Brought to you by boutique builder the Mission Group Secret Ridge Coquitlam homes for sale are situated in the very popular and sought after Foothills of Burke Mountain neighbourhood. Here, The Mission Group has master planned a new collection of only 74 craftsman designed Burke Mountain Coquitlam homes for sale with four distinct enclaves, all which are surrounded by nature and bordered by a creek on either side of the project site, which makes it a truly private setting. Located within the heart of The Foothills of Burke Mountain, the new Mission Group Coquitlam Secret Ridge homes for sale will present very spacious 3 and 4 bedroom homes that will range from approximately 2,200 square feet all the way to 2,500 square feet, making them ideal for couples as well as families of all ages. Not only that, but the new Coquitlam Secret Ridge homes for sale are also great for both upsizers seeking something a big smaller than a traditional single family house as well as downsizers who still want space for friends, family, storage and multi-level living. The presale Burke Mountain Coquitlam Secret Ridge homes by The Mission Group will feature an orientation towards the very beautiful south facing valley views (great exposure to natural light). As well, each of the paired residences at this amazing new project will feature double wide garages that also include traditional style driveways. Also, many of the homes at the Secret Ridge Coquitlam Burke Mountain real estate development will cater to those homebuyers looking for master bedrooms on the main floor. All will include chef inspired gourmet kitchens as well as great rooms/living rooms with vaulted ceiling heights. In addition, many of the homes will have landscaped backyards. The development team consisting of Robert Ciccozzi Architects, i3 Interior Design and MGC Construction is superb. Presales are expected to start in early 2013. The starting presale price point for the new Burke Mountain Coquitlam Secret Ridge homes by Mission group is expected to start from just the low $600,000s. 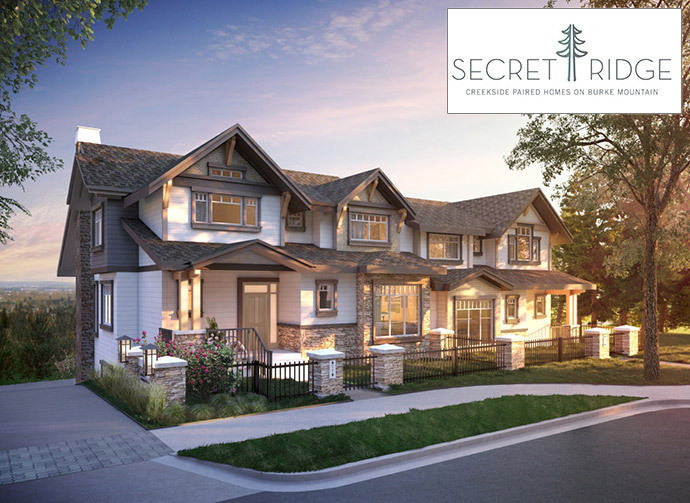 SECRET RIDGE by Mission Group > Available Early 2013 > For more information and to register: www.secretridge.ca. Secret Ridge By Mission Group Is Coming This March! The Foothills Coquitlam Secret Ridge homeowners will also get to enjoy spacious living areas and generous patio sizes – many with expansive southern views.